An odd thing happened in the 20th century: houses became some of the most famous buildings in the world. Versailles was somebody’s house, but it was mainly a powerful nation’s seat of government. Palaces in Italy were homes to princes and merchants, but they were mostly where the people’s business was conducted. In 19th century America, libraries modeled on those same palaces -- such as the Boston Public Library and the New York Public Library -- were some of the most spectacular buildings any American would ever experience—not to mention train stations, court houses, city halls and universities. It was taken for granted then in America that public buildings should be the best buildings. We still produce special buildings like music halls and museums, but mostly they’re privately funded, singular, and special. Most of us would agree most of the public buildings we encounter these days are uninspiring at best and mostly depressing. How is it that the best buildings are people’s homes and the worst ones are the ones we pay taxes for? Modeled on palaces of princes the Boston Public Library and others like it across pre-war America were built in honor of democracy and the people for whom our nation was established. Some would argue too much democracy has happened. Others would say too much regulation and still others that we shouldn’t spend limited tax dollars on fancy buildings (the “Taj Mahal” comes up a lot). Architects who build schools, libraries, civic and community buildings work with multi-faceted “clients” within complex decision-making hierarchies, webs of individuals with different interests and different opinions. It is challenging to create a good building for anyone when no one’s really in charge. Regulations make things difficult too, especially for schools and especially in California. There are so many regulations in so many areas that one could almost design a building by simply following the regulations. And many do – it’s just easier. We make the regulations our client. Then there’s the craziest of all in this up-is-down world: a high-quality school or library is considered not the place to "waste" money, while we seem to have no problem with ultra-luxurious mansions of high fashion on the upper east side or palaces of high design on Rodeo Drive. The main reading room of the Boston Public Library is popular to this day, less for the state-of-the-art technology it offers than for the magnificent place it provides. All of this is true, but all of it can be overcome and none of it is the real problem. The real problem is that as a pluralistic, open society who welcomes people from all over the world from many cultures and traditions with different experiences, memories, and tastes, none of us can agree on what looks good. When a nation is an idea—a self-conscious fabrication that links people by way of a set of principles and laws rather than the organically formed ties of a shared history and culture—what buildings should look like is never a foregone conclusion. We therefore avoid. We default. 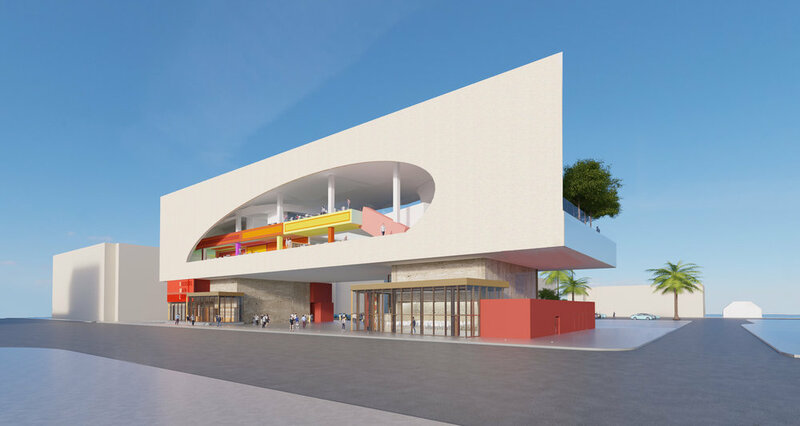 The Riverside Main Library is configured to remake its neighborhood. It promotes interaction with pedestrians and captures magnificent views of surrounding mountains to the west and north. For the first century of our nation’s history we saw ourselves as the inheritors of western (euro-centric) history and our architecture followed suit. The 19th century brought forth the era of imperialism, colonialism, and cultural appropriation associated with revivalism and eclecticism, the loss of meaning and dissolution of the sophisticated and intricately written 5,000-year Greco-Roman tradition of architecture. The 20th century brought more disruption—accelerated immigration and the rapidly increasing diversity of our populations. Inspired by ancient architectures and modern art the interiors of the library will reflect in character and décor the rich diversity of the people of Riverside and the architecture of its downtown. Architecture in America has never really honestly addressed these changes mostly because we have been distracted by: 1) the hyper-ideological sometimes puritanical, certainly intellectual and euro-centric modern movement in architecture; 2) the hyper-functional, sometimes puritanical, certainly pragmatic values of the “greatest generation”—those men and women who came of age during a traumatic world war and who rightfully dominated our culture throughout the latter half of the last century; and, 3) the hyper-idiosyncratic, sometimes indulgent, certainly personal nature of the signature architect seemingly endowed with — and certainly driven by — the unalienable right for self-expression. 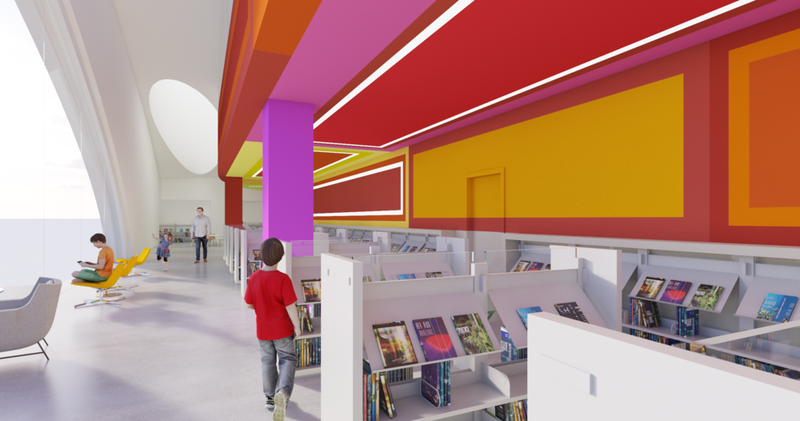 The children’s library offers a fantasia of color and light to instill in young people a life-long connection with the experiences and memories of where they first encountered a story or history or mystery. We are poised to move forward though — to put behind us the single mindedness of western classicism and post war modernism even as we can and must acknowledge that they both happened; they are a part of who we are and inevitably inform what we do. Our job now is to sublimate the lessons of five millennia and one century while we broaden our interests and expand what’s possible for an architecture of the 21st century. We can and will create architectures that more authentically express the wonder and grace that is the stunning diversity of us— architectures that ring true for us all.